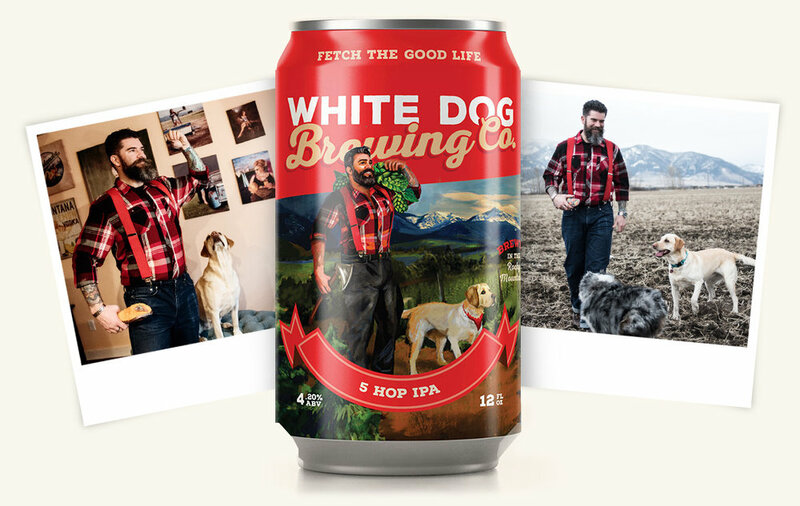 Andrew breaks new ground for White Dog as the first male model to grace a beer label. His contagious charm paired perfectly with Charlie the dog, whose ability to dazzle and delight almost any human was equally alluring. As is customary of all White Dog models, these two love to spend time outdoors. Fly fishing and hiking are Andrew’s go-to, while Charlie is partial to huckleberry picking and digging snow pits while backcountry skiing. Andrew’s status as White Dog’s first male model been anything but easy- he’s had to deal with paparazzi and endless autograph requests. Things haven’t been quite so difficult for Charlie, as she lacks the ability to write, and hasn’t yet fully realized her potential as a star. But we know her stock is on the rise, and her diva personality will soon take form. Best river beer? "I'm afraid it's tough to top a few ice cold Tecates with some lime on the river." What’s your favorite white dog beer (that you’re not on)? I like the sour! My wife and I went to the Great American Beer Festival in Denver 4 years in a row, 2007-2010, and sours had just become a "thing" one of the years we were there. Ever since I've really liked trying sours because they vary so much from brewery to brewery. White Dog's sour has a great balance of sweet and sour, the blackberry gives it a little more fruitiness, and there's nothing weird going on like some sours. It's pretty straightforward and well executed! I like super medicinal tasting cocktails, maybe I'm a little weird??? I love Fernet, I'll drink fernet straight... The Sazerac is always my go-to if I want a fancy cocktail as well. Big Lebowski by a long shot. I bet I've seen it in the hundreds of times. There are just so many scenes that I love in that movie. Actually, I like it so much I've got a tattoo on my thigh of the dudes car crashing into the dumpster. Flying would be the best, by far. Huckleberry picking—she beats her humans to the best ones. She also loves making sticks out of trees, finding tennis balls miles out on trails, scouting for carp, inspecting fish, and helping dig snowpits while backcountry skiing. What would your dog’s tinder profile say? Must like long runs in the woods and snow, taking turns eating popcorn, morning snuggles, evenings by the fireplace, willing to dress up in costumes, and sloppy face kisses. When riding in the car, she has to lay in the middle of the backseat with her head on the center console. She also never grew out of holding her leash in her mouth, and has a very specific morning routine of: kibbles, poop, snuggle.